Katherine Larkey was born on May 15, 1936 at Macksville, New South Wales. She was the sixth and youngest child of Patrick and Catherine Larkey (nee Gannon), having four brothers and one sister. Katherine herself wrote: “At some time after my birth my mother suffered a breakdown which had her hospitalised in Sydney for nearly two years. During that time my father managed with help from a housekeeper, but I was very often cared for by the local Good Samaritan Sisters at the Convent. For this, my family were always most grateful. My father in particular was deeply touched by the concern and support shown him by the Sisters. This enabled him to continue as an auctioneer, knowing the children were being cared for”. Her father died in August 1951. Katherine’s education from kindergarten to Intermediate was at St Patrick’s School, Macksville. From 1952-53 she was employed as a junior clerk with the State Public Service in Sydney, boarding with an aunt, first in Burwood and then in Belmore. 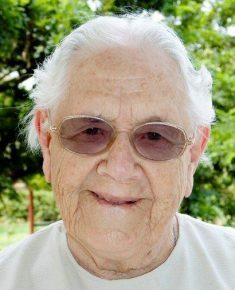 On February 10, 1954, Katherine entered the novitiate of the Good Samaritan Sisters at Pennant Hills and became known as Sister Mary Patrick, and then from 1979, as Sister Katherine. Her eldest brother Gregory was killed in a car accident in 1955 when Katherine was a novice. As Sister Mary Patrick, she made her first profession of vows on January 5, 1957, the year of the Congregation’s centenary. Having completed her Leaving Certificate during her novitiate, Katherine trained as a teacher at St Scholastica’s Teacher’s College. The first teaching appointment for Katherine was at Dee Why, to be followed by those in South Australia at Crystal Brook, and then as principal at Whyalla and Solomontown. In 1969 Katherine returned to NSW to Broadway as principal of the primary school and superior of the community. During this time her brother John died of cancer in 1972. A radical change came for Katherine in 1973 when she was asked to assist in the infirmary at St Scholastica’s and then to be part of the staff for the new Polding Villa Nursing Home and Hostel. With her precision for detail and her usual great generosity, Katherine gave of her very best to the elderly and frail sisters. In 1979 her ministry changed to secretary at St Brigid’s School, Marrickville during which time her mother died. In 1982 she became provincial secretary for the City Province. 1988 provided Katherine with a year of renewal before her return to Marrickville as a much valued ancillary staff member. In March 2000, another change for Katherine came when she was appointed portress and administrative assistant at St Scholastica’s Congregational Centre and later fulfilled the same position at the Good Samaritan Offices at Five Dock. From 2012 until May 2017 Katherine was the Centrelink liaison officer for the Congregation and lived in the Benet community at Glebe. In June of 2017 Katherine retired from many of these duties but continued to live at Benet until transferring to the new St Scholastica’s Convent in July 2018. Despite serious illness, Katherine continued her interest in and love for her family. Likewise to her local community – and its extension to the shopping strip along Glebe Point Road! Katherine’s gifts were legend – her attention to detail, her impeccable proof-reading skills, her reliability and trustworthiness and her copybook handwriting. She will be lovingly remembered for her empathy, her simple kindness, her delightful sense of humour and her gentle presence amongst us.